The striking bronze flowers make copper iris easy to identify. In Missouri, it is found in the southeast corner of the state. Three petals and three larger petal-like sepals form the classic "fleur-de-lis" shape. Copper iris is beardless and crestless and has a more flattened flower shape than other irises. 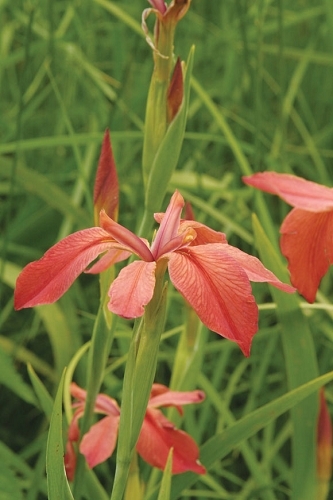 Copper iris was our "Native Plant of the Year" in 2014. One of four native irises in MO, it is clay tolerant and makes a great addition to rain gardens; it grows naturally in moist to wet soils. If growing in a perennial bed, make sure the soil is rich and organic. It may need to be thinned after a few seasons; it spreads via rhizome and can make a very large clump. Q: My copper iris did really well this year, and has put on a lot of seed pods? Are they able to grow from these, or only from the rhizomes? Thanks. A: They grow from seed, though germination can be sporadic over a couple of years. When you open a pod, the seeds should be soft and brown. You can sow them immediately, and often some will germinate by fall.